I am thankful that I get to see my daughters together again this Thanksgiving. I am thankful that both are thriving at their new schools. I am thankful that we have family and friends near enough to share a Thanksgiving meal. I am thankful that my mom is safe and happy in her new home and that my dad is learning to adjust to the new normal. I am Thankful for so many blessings. Awe, Thanksgiving…first I am grateful for the time off to enjoy my family and friends, fortunately there are too many wonderful people in my life to mention each one individually but you know who you are. I am grateful that I have good health even when it is not perfect. Thankful for fires in the fireplace and a good book, walks on the levy in the morning, the ability to travel and experience other cultures. And I am lucky to be living in Northern California where the fruit and vegetables are fresh from the farm and great wine is plentiful. And I am thankful for elastic waist pants that help me enjoy all of it! Thankful for my parents – with so many friends losing loved ones this past year I am surely grateful to still be able to have my parents around because no matter how old I am they can still help solve any problem I have. Thankful for my loving boyfriend who keeps me even when I’m crazy, for my good friends that I can call after months apart and pick up right where we left off, and family who is always excited to see me and hear what I’ve been up to. I’m also really thankful for a slow cooker – it’s my best friend in the winter months, and Google – everyone should be thankful for Google. First off, I am also thankful for my Therapist as well as for Carol and Cynthia for their understanding. And second, I am thankful for my family (two legs and four) and friends (two legs and four) all of whom do a wonderful job of reminding me that I’m human and that it’s not the end of the world that I don’t know how to turn the television on after the dog has eaten the remote for the second time. I’m thankful for a large, wonderful, supportive family and that I’m going to get to see them for the Holiday! I’m also thankful for a close group of friends here in Sacramento, my “chosen” family – they’ve made this one of the most rewarding years I’ve ever had! I am thankful for my three energetic healthy kids and my husband that walks me through this crazy life of parenting. Along with that, I am really thankful for a hot cup of coffee to give me a boost of energy. Also, I am thankful for the Holiday sales events like Black Friday Commercials that we buy on behalf of our clients. 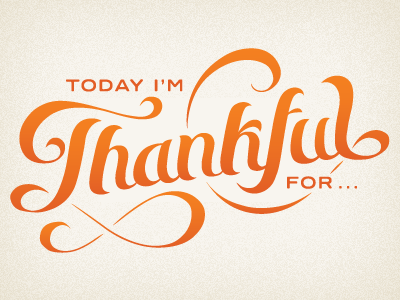 I am thankful for all the usual stuff, health, happiness, family and friends. But at this point of my life I am very thankful I have a great job that I love and work with a team that is professional, but are also fun to be with everyday.